There’s also a Festival pin available for all guests that’s a limited release logo pin. The Festival merchandise is available at Studio Store, Art Pergola near Studio Store, and Paradise Carts near Seaside Souvenirs. 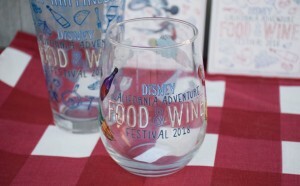 For the most up-to-date information on the 2018 Disney California Adventure Food and Wine Festival be sure to visit the Disney Food Blog’s 2018 Disney California Adventure Food and Wine Festival page.